The ACT Baha’i community was represented at a small gathering for a Hiroshima Day Vigil on Monday 6 August 2012, at the National Peace Park, Canberra. 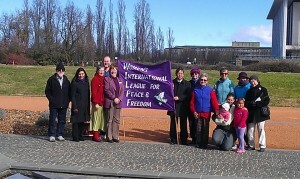 The commemorative event was arranged by WILPF, the Women’s International League for Peace and Freedom (WILPF), ACT Branch. The representative of WILPF made a brief introduction to the vigil and asked community groups to reflect on Hiroshima Day and the importance of nuclear disarmament and the promotion of peace. The Japanese Ambassador was invited and made a brief statement at the vigil. The gathering also observed a minute’s silence immediately following two prayers for peace.